Gretna Green, or is it Headless Cross? Gretna Green – the village famous for runaway weddings. Gretna Green is a village in the south of Scotland famous for runaway weddings, hosting over 5,000 weddings each year in the Gretna/Gretna Green area, and according to the BBC, one in every six Scottish weddings. It is situated in Dumfries and Galloway, near the mouth of the River Esk and was historically the first village in Scotland, following the old coaching route from London to Edinburgh. It has been reported that Gretna’s famous “runaway marriages” began in 1754 when Lord Hardwicke’s Marriage Act became law in England. Under the Act, if a parent of a person under the age of 21 objected, they could prevent the marriage going ahead. The new law tightened up the requirements for marrying in England and Wales but did not apply in Scotland, where it was possible for boys to marry at 14 and girls at 12 with or without parental consent. 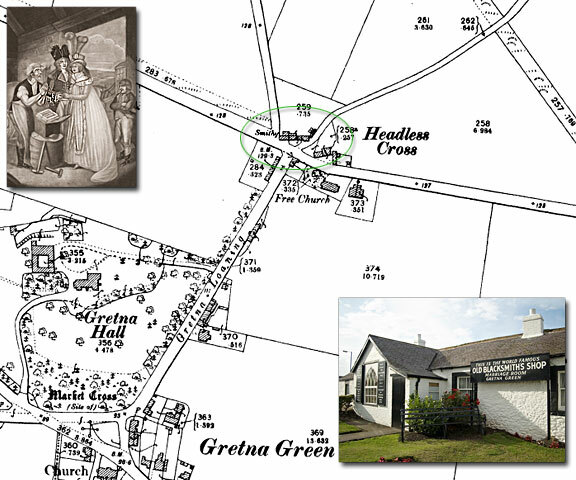 By the 1770s, with the construction of a toll road passing through the hitherto obscure village of Graitney (Gretna), that Gretna Green became the first easily reachable village over the Scottish border. The Old Blacksmith’s Shop, built around 1712, and Gretna Hall Blacksmith’s Shop (1710) became the focal points for the marriage trade. The Old Blacksmith’s opened to the public as a visitor attraction as early as 1887. The local blacksmith and his anvil have become the lasting symbols of Gretna Green weddings. Scottish law allowed for “irregular marriages”, meaning that if a declaration was made before two witnesses, almost anybody had the authority to conduct the marriage ceremony. To seal the marriage the blacksmith would bring down his hammer upon the anvil. The ringing sound heard throughout the village would signify that another couple had been joined in marriage. The blacksmiths in Gretna became known as “anvil priests”, culminating with Richard Rennison, who performed 5,147 ceremonies.